Sabbath Walk: God Put You There? TITLE: GOD PUT YOU THERE? Who am I to judge? How can I, who have never seen that doctor receive a vision on one morning out at a walk? How would I know that God had appeared to the school teacher the other day, when she was praying? How could I doubt the chef who reported some strange feeling in his heart while choosing some ingredients? Can I really question the calling of a missionary? Worse, are these simply self-assured words to cover up some personal preferences? Are they words to make one look good to the believing friend and earnest Church member? Or are they spiritual words of “insurance” to put the blame back on God if something ever goes wrong? At the end of Acts 7, which gives us the gruesome details of how Stephen was stoned to death, there was a man by the name of Saul who was in “hearty agreement” on how Stephen ought to be punished for blasphemy. This man, Saul was a top Pharisee, a formidable lawyer, and a prominent persecutor of Christians. That was his "calling." He could have ventured into the synagogues and be offered a prime slot to preach a sermon. He could have written spurious commentaries on the Law to demonstrate his authority and scholarship. He could have spoken with such conviction that there would be no doubt that God had called him to be the foremost persecutor of Christians. Maybe, it was less about his own special “calling” but more about his personal choosing. In Acts 8:3, we see how convictions about his "call" took shape. Who would dare argue against that? After all, we are not Paul. I have two concerns about fellow believers using the word “call.” The first is that of distinguishing the sacred and the secular, as if there is a gulf of quality in terms of serving God. I continue to hear people saying that Christian ministry is a “higher” calling. They look at me and think that I have some special words from God each time, even when I do not have a clue about their expectations. The second concern is that of people using God’s Name in vain, especially when things turn sour. If the doctor misdiagnoses a patient, and the patient subsequently dies, will the doctor turn around and blame God? If the class of students fail their provincial exams, will the school teacher shrug off her shoulders and admit that she was never really that “spiritual” in the first place? If the chef’s restaurant had a bout of food poisoning that sent hundreds of customers to the hospital, will the chef quit and said that God had betrayed him? If the missionary returned to his homeland, totally discouraged over the lack of conversions in the mission field, and subsequently quit the Church, will this missionary be failing God’s call? 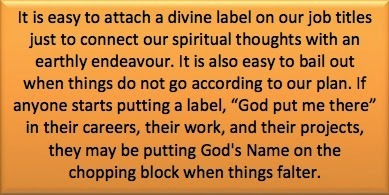 It is easy to attach a divine label on our job titles just to connect our spiritual thoughts with an earthly endeavour. It is also easy to bail out when things do not go according to our plan. If anyone starts putting a label, “God put me there” in their careers, their work, and their projects, they may be putting God's Name on the chopping block when things falter. One of the best books on calling is that of Ben Campbell Johnson, Professor of Spirituality at Columbia Theological Seminary. 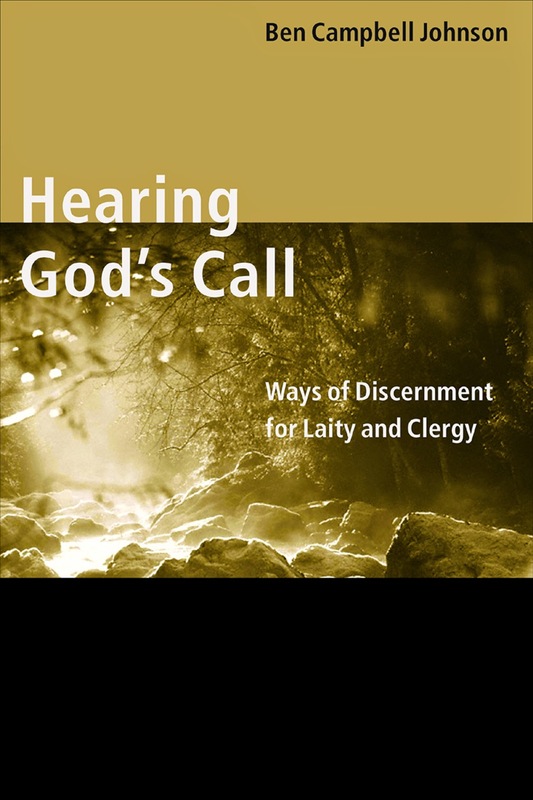 In "Hearing God's Call," he describes the call as one that leaves us with a “residue of certitude” that will help us ride ride waves of doubt. Such a conviction of the call will help the called to “face the doubts and struggles that are bound to come our way.” We talk about the ups and downs of life. If we are called to be an engineer, a writer, or a minister, we do not simply adopt a fair-weathered mindset, to boast of God when thing go well, and to go into hiding when things flounder. Just look at how much Paul suffered for the gospel. In 2 Corinthians, he described his own life. There is certainty of Paul’s faith that stands in both good times and bad. There is a humility that admits that success may not be forthcoming. Calling is sure and steadfast. It is not easily swayed according to results or trials. In fact, trials and tribulations only serve to push one closer to God, like Paul. If any calling is from God, it is always a calling to be closer to God, not farther. The trouble I have with people doing a “God put me there” as a one-time sticker to prove his own spirituality is precisely about that consistency. What if the business fails? What if you get sacked? What if the job turns out terrible? Will we then turn around to say we have misheard God’s call? No. The call of God will not change, even when the packaging has changed. I think calling is about the grace of choices and choosing. God gives us a choice. We then choose from the range of options. Grace is only grace if it is freely given and freely received. It makes no demands on the recipients to accept something when they are not ready. Neither does it require givers to give when they are uncomfortable. Grace is about free choice. Being called of God is about that free choice. Out of the range of options God had allowed us, we freely choose the one we feel best, the one God is leading us toward. That is why for many of us, we need help to discern anything before any commitment. The choices before us are like the mountain of different locks. We have only one key. Through the best wisdom and discernment available, faith is that best decision at that time to use that key to try to open any one particular lock. It may open or it may fail to open. Yet, one thing is clear. It is the obedience that pleases God. A thoughtless "God put me there" can very well violate that free choice, putting the blame on God for inserting us into that measly job against our wills, and make us like robots forced to do something not of our choosing. I am not comfortable with one-timers who brandish a “God put me there” label at the beginning, only to retreat quietly with their tails between their legs when things go wrong. They not only embarrass themselves. They put the notion of calling into disrepute. I prefer to say, “God graciously let me choose, and I gratefully choose to serve God in this particular vocation at this particular time.” If this sounds like a mouthful, let me suggest another. Rather than utter “God-put-me-there,” why not say: "God let me choose. I choose to serve as a _______." (choose doctor; or a school teacher, a banker, a student, a minister, a chef, and so on.) It is not what I do that matters. It is who I serve. What I do is not less about a job or a highly spiritualized career. For I am called first and foremost, to Christ. I am called to be a servant of Christ. I am called to worship God, to follow Jesus, and to live in the wisdom, the guidance, and the power of the Holy Spirit in this world, out of the range of options graciously provided for me, I choose to serve God as a pastor, a teacher, a technologist, a writer, a spiritual friend, and of course, a brother in Christ. God let us choose to be where we are. Whatever we choose, may we all choose to do so in honour of Jesus' Name. Always.